The widow of a County Londonderry firefighter has said she is "relieved" to find out who "ordered" her husband onto the roof of a burning hotel in Limavady. 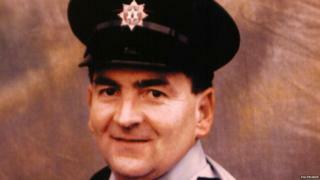 Joe McCloskey, 50, died in a blaze at the Gorteen House Hotel on Halloween night 2003. He died in a storeroom at the hotel, after the roof he was working on collapsed, dropping him into the flames below. He suffered burns to 95% of his body. Twelve years on and Northern Ireland's Attorney General has sent the McCloskey family a letter naming the former senior officer who he believes ordered Joe McCloskey on to the roof. The former senior officer named is James Quigg, as was reported in The Irish News on Wednesday. The Northern Ireland Fire Service did conduct an investigation after the death of the father of five. However, it failed to establish who gave the order to Mr McCloskey to go onto the roof. Nobody was ever disciplined over the incident. Attorney General John Larkin said in the letter: "Having carefully reviewed all of the evidence the Attorney General is of the firm view that Mr Quigg ordered Mr McCloskey and a colleague to go onto the roof." Culpability was not discussed in the letter. The Northern Ireland Fire and Rescue Service agreed to pay "substantial damages" to the family. Image caption Mr McCloskey's son Seamus and wife Marie say they "think about him every single day"
Mr Closkey's wife, Marie, told BBC Radio Foyle that a "big piece of the puzzle has been found". "I'll never forget the night I lost my Joe," Mrs McCloskey said. "A nurse told me the seriousness of Joe's injuries. Her words were that he wasn't going to do. "The fear in Joe's eyes, I will take to my grave. He spoke to me, I didn't get speaking to him. "He told me, he loved me. "The void in this house will never be replaced. There is an empty chair there and that empty chair will be there for the rest of my life. "The inquest and the fire service investigation only gave us more questions. We discovered that the finding from the report was that 10 minutes into the fire the building was already lost. "This letter and this name is all we ever wanted. It has closed another chapter for us. When we read the letter there were a lot of tears. "We finally have the answer to our question 13 years on." A spokesperson for the Northern Ireland Fire and Rescue Service said: "We understand the continued loss and pain felt by the McCloskey family and Joe's death remains a tragic loss for NIFRS. "Over the years NIFRS has done everything that could be expected of us to address the family's concerns and queries in relation to Joe's death. "This included our own internal Fire Brigade and Fire Brigade's Union investigation and our full co-operation with the external investigations carried out by the PSNI and the Health & Safety Executive, as well as implementing the recommendations from the H&SE investigation, and we gave evidence at the Coroner's Inquest in 2007."